The Earth literally shattered a majority of Haiti’s buildings and infrastructure during the recent tragic earthquake there. Natural disasters like this can make one wonder if our tables and chairs won’t suddenly disintegrate in front of our very eyes. Fortunately, that question has been answered a long time ago. Since Homo sapiens ruled the Earth, our world’s greatest minds have been bothered by one question (actually, they had many questions, but this particular one was rather important). That question was “What is the world made up of?” We have discovered since that it is made up of matter. But what is even more interesting is what matter is made of. 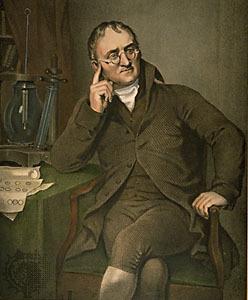 In 1807, the secret was finally revealed by John Dalton. He discovered that matter (as a matter of fact) is made up of particles. Particles are made up of molecules, which are made up of atoms, which for the longest time scientists thought was the smallest thing in the world. However, when said atom was cut open, it revealed an even smaller nucleus. A breakthrough was made in 1919, when a scientist named James Chadwick discovered that revolving around the nucleus were clusters of tiny protons, neutrons, electrons and about 70 other, miniscule sub-atomic particles. Thus, the Kinetic Theory is a fascinating one. That’s because it states that the world is made up of the aforementioned atoms, which are the tiny building blocks that support our lives. The notion that we big, heavy humans are supported by these little, cannot-be-seen-by-the-naked-eye things seems hard to believe. But it’s true. For example, the particles which, bit by bit, make up the computer which you are using to read this now are actually moving. The movement is a very, very slight vibration fueled by kinetic energy. Throughout all the matter in the universe, kinetic energy is coursing through it. Some have less and some have more. Your computer has less, much less kinetic energy than say, your mum’s perfume. That’s because your computer is a solid and your mum’s perfume is a gas. The people you just imagined are actually particles, which make up solids, liquids and gases. The simplest example is water. As we all know, water is a liquid. But when we freeze it, it magically becomes its solid form, the hard, dense ice. That is because the water has hit its freezing point of 0°C, thus freezing the liquid into a solid. Likewise, doing the opposite and heating the water till it reaches its boiling point of 100°C creates its gaseous form – steam. So when heated up, the water particles gain heat energy and move faster and faster till they break free of their bonds and is then free to move about at a high speed, occasionally colliding with each another in their new state of matter: gas. Have you ever noticed that when a person wearing a strong, pungent perfume walks into a room, within a few minutes the entire room smells like said perfume? Well, that magic is called diffusion. With the high freedom these gas particles have, it’s not surprising how versatile they can be. For example, if gas is put into a jar, you will notice that it will spread itself out quickly and evenly. That’s because the gas particles move. In fact, they move so fast, that gases take mere hours to diffuse. Liquids, on the other hand, can take days to diffuse as liquid particles move slower than that of gases. For many years, there was no proof that particles move. People were still uncertain what exactly we and the world were made of. However, about 150 years ago a scientist and botanist named Robert Brown erased all doubt and uncertainty regarding atoms. While gardening one day, he noticed that the fine pollen grains on the surface of the water were moving about, upon further investigation through his microscope, he discovered that the pollen grains were moving about in random motion. Progress on this was made slowly but surely, but the breakthrough was in 1923 when another scientist, Norman Wiener, made what Brown had noticed clearer. He stated that the visible, tiny pollen grains were constantly colliding with the scores of water particles, causing the random motion. That breakthrough is called Brownian motion, after the scientist who discovered it. Certainly, the world seems more fascinating once you have discovered atoms. And it is nice to know that the world is probably not about to crumble beneath our very feet.